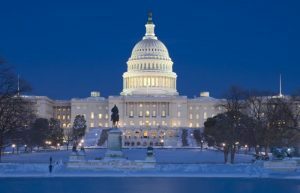 As the longest government shutdown in US history stretches into its 28th day, Americans’ trust in their government is declining, according to the most recent Chicago Booth/Kellogg Financial Trust Index (FTI) survey.1)The full Financial Trust Index will be released during the last week of January. At the end of every year, the FTI, an initiative of the University of Chicago’s Booth School of Business and Northwestern University’s Kellogg School of Management, polls around 1,000 Americans on their trust levels in institutions. This year, the survey was conducted through December 18–27, 2018 and experienced a shock in the form of the government shutdown, which began at midnight of December 22. We tracked the “trust in government” index in our data by date. 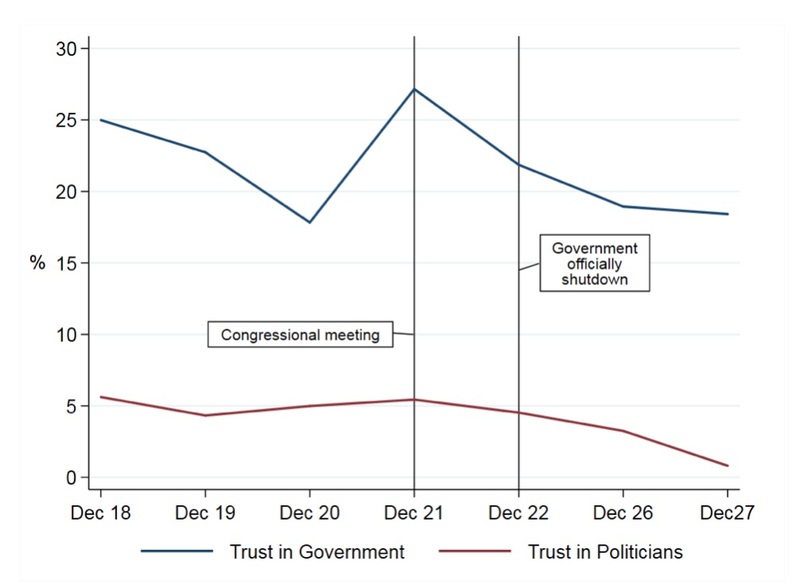 As shown in Figure 1, on December 18 the level of trust in government was at 25 percent, which is higher than the level of 21.1 percent recorded at the end of 2017. Americans’ trust in government reached 27.2 percent on December 21, when lawmakers met for negotiations before the shutdown, possibly due to high expectations that a consensus would be reached. However, just after the Senate and House adjourned without reaching a deal, trust plunged sharply. As of the last day of the survey, December 27, Americans’ level of trust in government was at 18.4 percent. This figure is even lower than the level of 19.1 percent recorded at the end of 2016, following the election of Donald Trump. This trend can also be seen in the decline of trust in politicians. Public trust in politicians was fairly stable before December 18, fluctuating slightly around the level of 5 percent. It dropped right after December 21, dipping to its lowest point, 0.8 percent, on December 27. That is, less than 1 percent of respondents said they trust politicians. Using December 22, 2018 as the cutoff, we split the data into prior-to-shutdown and post-shutdown and broke down the respondents by political affiliation. We found an interesting phenomenon: Surprisingly, Republicans and Democrats expressed similar levels of trust in government in the period prior to the shutdown: 29.8 percent and 28.9 percent, respectively. After the shutdown, although both affiliations showed decreases, the figure for Democrats dove from 28.9 percent to 13.6 percent, while among Republicans trust in government dropped from 29.8 percent to 20.4 percent. The shock of the shutdown widened the gap between the two affiliations, from 0.9 percent to 6.8 percent. This result aligns with some of the recent polls on who is to blame for the shutdown—most Americans believe Republicans should take responsibility. 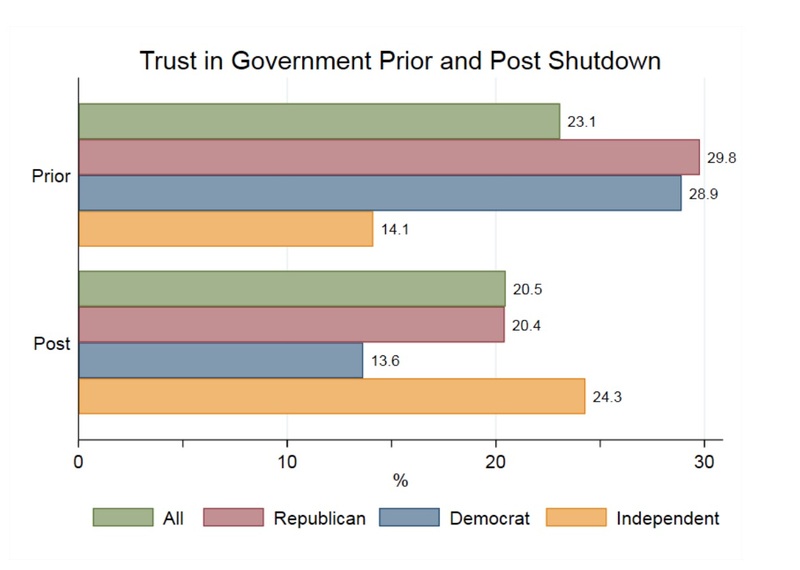 The puzzling part in Figure 2 is the reaction of respondents who identified as Independents: Their trust level increased from 14.1 percent before the shutdown to 24.3 percent after. Due to the limited timeframe, however, we cannot infer much from this increase. The 27th wave of the Financial Trust Index survey was conducted from December 18 to December 27, 2018. The survey polled 1,010 American adults on their confidence in institutions, professions, and media. Political affiliation is self-reported by respondents with the following categories: Republican, Democrat, Independent, and Other. Among 978 of the respondents who answered this question, 25.4 percent identified as Republicans, 31.8 percent as Democrats, 41.97 percent as Independents, and 0.81 percent as Others. The exact question regarding trust in government and politicians is: “On a scale from 1 to 5 where 1 means ‘I do not trust them at all’ and 5 means ‘I trust them completely,’ can you please tell me how much you trust the government/politicians?” In the analysis of this post, we aggregated those who answered 4 and 5 and labelled them as trusting the government/politicians. 1. ↑ The full Financial Trust Index will be released during the last week of January.